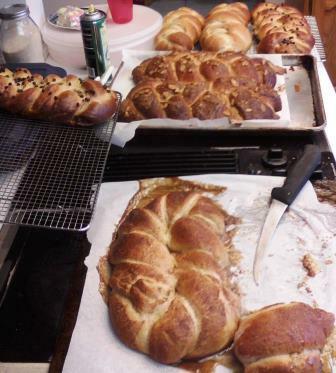 Yesterday and today, I made challah. It’s an overnight recipe. I had too many egg yolks in the fridge, and this is one way that I cope. It made eight loaves total: 2 plain, 2 filled with the caramel I use for caramel rolls, 2 with apricot jam and chocolate chips (babka bread), and 2 with almond cream cheese filling. The caramel leaked out all over the oven and cookie sheet (and of course, I wasn’t forethoughtful enough to use a lipped sheet), so we rescued as much as possible by using what was left on the pan as a dip. The rest seem to have turned out all right. 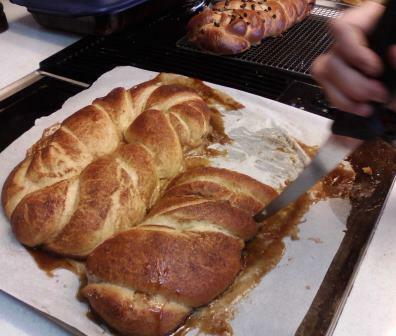 The Challah recipe is from Peter Reinhart’s “Artisan Breads Every Day“. I use a tablespoon of salt instead of the teaspoon he calls for, and I sub out whole wheat flour for half of the white that he calls for. I roll out the dough on the table and cut it into strips; if I’m filling it, I spoon the filling into the middle of the strip and seal it up before I braid. Usually this works. Nobody seems to mind if it doesn’t. 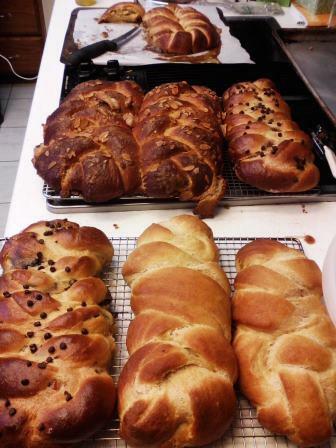 This entry was posted in Baking and tagged Artisan Breads Every Day, babka, Braided Challah, bread, challah, cinnamon challah, filled challah, half whole wheat challah, Peter Reinhart, Reinhart, Reinhart challah, whole wheat challah. Bookmark the permalink.